"Planned giving" means many things. It can mean that the gift may be deferred until after the death of the donor. It can mean that it is a current gift, for which the donor(s) receives an income for certain years or their lifetime(s). Sometimes, it means a combination of both. Jack and Betty Brant have chosen this combination method. They have made outright gifts of stock to supplement their two scholarships for the benefit of Ashland University and Ashland Theological Seminary. They have consistently added cash to their existing charitable remainder unitrust which will also ultimately benefit those existing scholarships. In addition, they forgo the income from their gift so they can see it be used during their lifetimes to witness the direct impact. 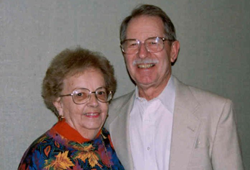 Jack, trustee emeritus, and wife, Betty, are well known for their long time generosity (both in time and money) to Ashland University, Ashland Theological Seminary, and the Brethren community.